Monday, October 29 at 7:00 p.m.
Every year thousands of migrant workers come to Canada to do the work Canadians don’t want to do. According to Fay Faraday’s report published by the Metcalf Innovation Fellowship, in 2006 more temporary foreign workers entered Canada than did the number of economic immigrants receiving permanent resident status. This fact begs the question of whether we are seeing the end of immigration as we know it in Canada. Many of these workers end up in Manitoba. They arrive under the auspices of different programs, including the Live-in Caregiver Program and the Seasonal Agricultural Workers Program. For example, every year, 400 mostly Mexican workers toil on Manitoba farms to make sure that we can all enjoy low-cost produce. But these workers do not have the same rights we do, even though they pay taxes, EI and CPP, and many come year after year for up to 6 months every year. Some have been coming for over 20 years, but they are NEVER allowed to immigrate. Changes in the food industry, underpinned by globalization and aggressive retailers like Wal Mart mean that local producers are constantly having to lower their operating costs. They will admit very openly that they are forced to demand lower and lower labour standards – standards that no Canadian would tolerate. Growers can’t move their farms to Mexico where labour standards are more “acceptable”, so they move Mexican workers to Manitoba. This trend is becoming entrenched across Canada – in the construction, fast food and resource extraction industries as well, and it has grave implications for immigration policy, labour markets and the kind of society we are becoming. It’s time we all understood this situation and began to think about the implications of supporting a two-tier labour market where a vulnerable underclass is exploited in the name of economic efficiency. 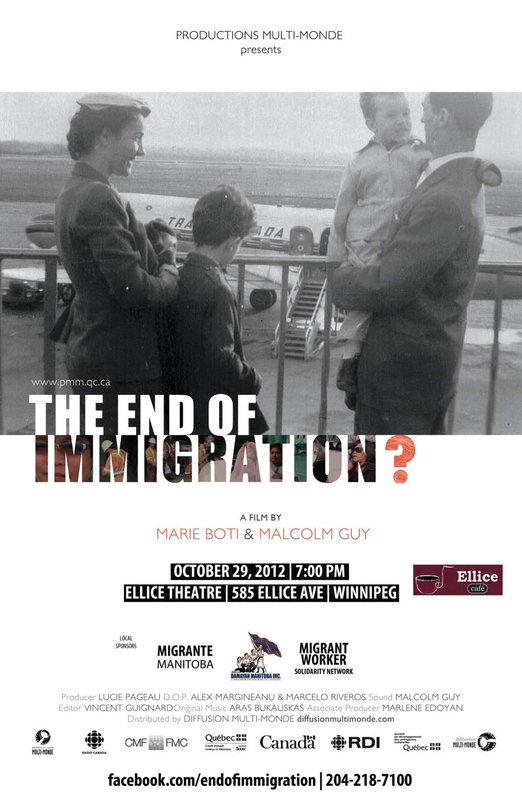 This Monday at 7 p.m., the showing of the documentary, The End of Immigration will begin a conversation here in Winnipeg. Members of the Migrant Workers Solidarity Network, who work with the Mexican agricultural workers, and from Demayan Manitoba will be on hand to answer questions, along with one of the producers of the movie.